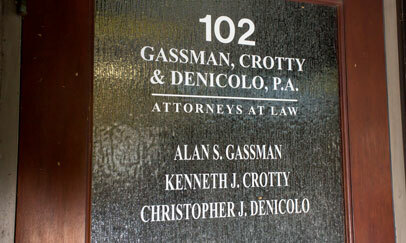 Maps and Directions - Gassman, Crotty & Denicolo, P.A. As you exit the airport, keep in the right lane and look for signs to “Veterans/Westbound State Road 60/Clearwater”. The exit for “Veterans/Westbound State Road 60/Clearwater” will be the first exit on the right. After exiting, use the left lane of this ramp, and fork left to “Clearwater/WB SR 60”. Once entering these frontage lanes, take the first left exit onto westbound SR 60 which will put you onto the Courtney Campbell Causeway. Stay on the Courtney Campbell Causeway until the road becomes Gulf To Bay Blvd. You will eventually see the Clearwater Mall on your left and several restaurants on Gulf to Bay Blvd. As you approach Highland Avenue, you will see signs to Downtown (right lanes), and Beaches (left lanes). At Highland Avenue, stay in the left lanes to go straight through the intersection, and this will put you onto Court Street. You will see a lakefront park on your left. Shortly after the park you will see our tan building with black awnings also on the left. Make a U-turn at Lincoln Avenue, and pull into our parking lot. If you reach the intersection of Missouri Avenue, you have gone too far. Our entrance is in the middle of the complex. Take the Courtney Campbell Causeway (AKA Highway 60) to Clearwater. Stay on the Courtney Campbell Causeway until the road becomes Gulf To Bay Blvd. You will eventually see the Clearwater Mall on your left and several restaurants on Gulf to Bay Blvd. As you approach Highland Avenue, you will see signs to Downtown (right lanes), and Beaches (left lanes). At Highland Avenue, stay in the left lanes to go straight through the intersection, and this will put you onto Court Street. You will see a lakefront park on your left. Shortly after the park you will see our tan building with black awnings also on the left. Make a U-turn at Lincoln Avenue, and pull into our parking lot. If you reach the intersection of Missouri Avenue, you have gone too far. Our entrance is in the middle of the complex. Take I-275 North to exit 16 - Clearwater. Head west until you reach 49th Street and turn right. Follow this road to the Bayside Bridge and take the Gulf-to-Bay Boulevard, a/k/a Highway 60 exit. Turn left onto Gulf-to-Bay Boulevard. As you approach Highland Avenue, you will see signs to Downtown (right lanes), and Beaches (left lanes). At Highland Avenue, stay in the left lanes to go straight through the intersection, and this will put you onto Court Street. You will see a lakefront park on your left. Shortly after the park you will see our tan building with black awnings also on the left. Make a U-turn at Lincoln Avenue, and pull into our parking lot. If you reach the intersection of Missouri Avenue, you have gone too far. Our entrance is in the middle of the complex. Take U.S. 19 South and head west on Gulf-to-Bay Boulevard. As you approach Highland Avenue, you will see signs to Downtown (right lanes), and Beaches (left lanes). At Highland Avenue, stay in the left lanes to go straight through the intersection, and this will put you onto Court Street. You will see a lakefront park on your left. Shortly after the park you will see our tan building with black awnings also on the left. Make a U-turn at Lincoln Avenue, and pull into our parking lot. If you reach the intersection of Missouri Avenue, you have gone too far. Our entrance is in the middle of the complex.